Yummy yummy! This is my all time favourite-Flaky Yam Mooncakes with yolk!! Ever since I was introduced to Crown Prince's Yam mooncakes (about a decade ago??) I was hooked onto it. I don't used to like mooncakes when I was young. However, when there were mooncakes at home, I'd helped my mum to finish them bit by bit. Otherwise, none of my sisters like mooncakes. The pieces of mooncakes I took is like one-sixteenth size. I ate for the melon seeds only, and I don't take salted eggs. As we all knew, during the 80s, there were only the normal lotus paste, with or without salted eggs. That limited variety! Times have changed. There are so many varieties now we're really VERY spoilt for choice. There are the alcoholic, fruits, food etc etc. Still thinking if I should buy mooncakes this year since I've started baking. No traditional baked mooncakes for me, although I like baked green tea mooncakes too! Thinking that snow skin mooncakes weren't that difficult since I have all the ready-made ingredients, I made the Green Tea mooncakes after baking my walnut moontarts. I wasn't ready to bake snow skin initially, and didn't have any ready recipe to follow. I had to search the web for a recipe using the pre-mix snow skin. I finally found one at Sweet Decadenze. I tried to follow her recipe, hopefully it worked. 1. Add ice water to the premix and green tea powder to form a soft dough. Do not add all the water at one go. Check for consistency before adding more ice water in. 2. Knead in the shortening. Ensure that no lumps are formed and the dough becomes smooth. 3. Leave the dough aside to rest for about 30-45 minutes in a cool, dry place (or chill in the fridge). 4. Meanwhile, spread green tea paste on a piece of plastic sheet. Spread melon seeds on the paste and roll the paste up like rolling a swiss roll. Spread the paste and roll it up again to make sure melon seeds are nicely "embedded" in the paste. 5. Divide mooncake paste into 20 portions of about 26g each. Knead each portion a little and form each into a ball. 6. Divide the rested dough into 20 portions of 20g each. Knead each portion a little and form each into a ball. 7. Flatten a snow skin dough on your palm to be a 2-inch circle. Press to make the edges thinner than the central part. 8. Place a ball of paste. Start pushing the paste against the dough. 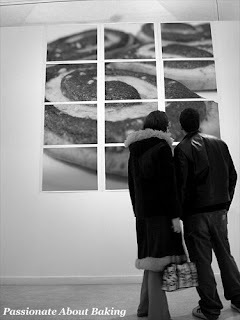 As you push the paste, the dough will start enlarging. 9. Wrap up the mooncake and roll into a ball. 10. Place the ball into the mould and press until a flat surface is achieved. 11. Knock out the shaped mooncake from the mould by lightly knocking in all directions with one hand and using the other hand to catch the dislodged mooncake. 12. Immediately chill the mooncakes in an airtight container. a) I used about 115g of water, which resulted in a very soft skin. So when I tried to remove the mooncake from the mould, it is extremely difficult, and you can see that my designs are not sharp, as some of the skin were actually stuck to the mould. b) The mould I used is from Phoon Huat. Therefore, halving the recipe makes exactly 20 mini mooncakes. d) You may add colouring to the snow skin if you prefer darker green. e) Some of the steps above were extracted from Jo's Deli. You may refer to her site for more detailed steps. I didn't think that I will attempt to bake this at first. However, after my colleague has tried and told me it's very good, I cannot resist it. Furthermore, my family likes to eat this, so I thought I might as well try to bake it. This is none other than the Walnut Moontarts! These walnut moontarts (or walnut mooncakes) were made famous by Harbour City Restaurant. We used to be really crazy over their moontarts. However, I seemed to have outgrown that now. *Note: Not advertising for them. But since my colleague has given me the recipe she found on a web, and it doesn't look so difficult, so I thought I might as well try baking it! The recipe is extracted from Asiacuisine-Walnut Moon Cake. Madeleine Madeleine where art thou? Is that supposed to mean "where are you?" I didn't study Literature in Sec 3 & 4, so I'm not too sure. ;p I'm not one who can write fanciful pretty English, so Literature is really not my cup of tea. I prompted Yuri that I wanted to try baking Madeleine, when I saw this blog recipe. It looks so pretty and yummy. It's such a simple cake with great taste. However, she reminded me about the amount of butters and eggs in it. Hmm... I wondered which yummy dessert is not sinful huh? Then she recommended me another madeleine recipe. This recipe uses egg whites. Wow! Doesn't that sound wonderful? Plus, I just bought my madeleine mould on that day, so I'd give it a try. It turns out, the madeleine is very good! It's best eaten when warm, yummy yummy! Here is the tribute to the greatest profession - Teachers! Baked my second half of the Chinese Ear Cookies today. Looks more presentable today. Your favourite, My favourite, Our favourite! Remember during our childhood days, we love those biscuits which has sugar colourings on top similar to the "Olympic fire". It has green, pink and yellow. I like to eat the icing first, then the biscuits so that it won't be too sweet. 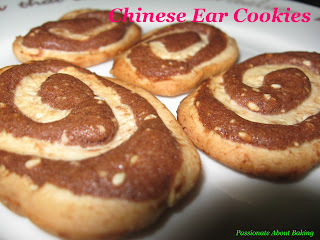 Another one which I like is the Chinese Ear Cookies! I was delighted when I knew that I would be baking this cookies during my Professional Course earlier this year. To refresh my memory on baking the cookies, and to satisfy my craving for the cookies, I finally baked it today! Not quite like it, but the taste was "u-lah-lah"! My children love it, and so does my maid! Sorry folks, as this recipe was from my course, I cannot share it though I would really like to. Apologies! I've always love to eat chinese carrot cakes, regardless of steamed ones, or those fried carrot cakes. So I found a recipe for this, and prepared to give it a try to steam it. So here it is! However, I found it to be a bit bland. I guess I should've put more salt, or at least use chicken stock? Nevertheless, it's the first try, so next time, I'll use chicken stock so that it will be tastier! Recipe extracted from Prisneo's Steamed Carrot Cake. one for my own family, and another for my parents & sisters. I promised my sister I will bake a cake for my nephew for his 7th birthday on Saturday. I specifically asked her to ask him what kind of cake he would like. He had said, chocolate, and only chocolate. So I thought, chocolate cakes are not difficult isn't it? All over, there are many chocolate cakes' recipe. I thought of baking Kitchen Corner's Chocolate Moist cake. Doesn't look too difficult, and looks quite impressive if I can bake that. Then I decided to bake from "Delicious Cake" by Amy Heng. I chose the Moist Chocolate Cake to bake on Friday evening. Somemore, I baked a 10-inch cake. How bad can that be right? From the oven, to removing from the pan and cooling, everything was fine on the evening. To my dismay on Saturday before I assemble the cake, the inside of the cake was not fully cooked! When I tried to slice it horizontally, it broke into crumbs! Arrgghhhhh! I was so disappointed! I purposely cooked double portion of the Chocolate Fudge from Kitchen Corner's Chocolate Moist Cake recipe. Despite being crumpy, I tried my very best to assemble the cake, hopefully the fudge can save it! I was wrong! Totally wrong! Because the fudge that I cooked turned out to be quite starchy and lumpy, wasn't as shiny as Kitchen Corner's and doesn't look so easy to spread too! It made spreading even worst! The more I tried to cover up, the more the cake came up! It was really nerve-wrecking! I asked myself if I can still proceed to bring this no-standard lousy cake over to my mum's house. Pondering...thinking of the impression I will give, and the disappointment I will see in my nephew's face. Now I know why "she" (one of the blogger) need to seek for ideas when it comes to baking a birthday cake! I'm also like her, totally lost, and not quite confident of presenting a good cake in front of others! I hope hers turn out to be as successful (as my 2nd attempt)! Wish her all the best, and hope her guests love her creations! My family members have been ill one by one. Last week, my daughter contracted stomach flu. It was very very serious. Anything that goes into her mouth, the next moment, she "merlion"! It was quite tiring taking care of her as she kept complaining her tummy pain, hands pain, feet pain. She not only vomitted but also farted a lot, but cannot pass motion. Her illness lasted for five days. Then Monday evening, my youngest boy vomitted and said his tummy pain. So today, home again. Youngest boy still not well. Daughter didn't go to school as we wanted to bring her to see a doc at the polyclinic, due to her inverted eyelashes. Home whole day. Was thinking what to bake today. Finally, I decided to try to bake the Alex Goh sponge cake again. Instead of baking round cake, I baked a square cake. Cut it into half and put different fillings in them. One is strawberry jam while the other is white chocolate ganache. The cake was quite nice actually, soft. Recipe for the Coffee Sponge Cake extracted from Alex Goh's "Creative Making of Cakes". 1. Put (A) in the mixing bowl. 2. Whip (A) till light and fluffy. 3. Fold in (B) and mix till well blended. 4. Stir in (C) and mix well before adding in (D) and mix until well incorporated. 5. Pour batter into a 8" round mould. Bake at 180C for 30 minutes. 6. Remove it from the mould immediately when baked. Guess the number of Durian Puffs!